Last week one technology giant announced a wow-inducing new gadget while another killed its plans to release a similar product. This story is familiar, of course, but what’s different is which company was stepping forward (Microsoft) and which was stepping back (Google). Within the span of a week, Microsoft—which has had more than its fair share of product fails this decade—revealed a prototype of HoloLens, a pair of augmented reality goggles, while Google said it would be halting production of its current iteration of Google Glass, its own wearable device. The parallels and timing led many to conclude that a seismic shift had just occurred in the tech world; that Microsoft, a Goliath-turned-David, is on the rise again while Google, a David-turned-Goliath, is poised to fall. There is a bit of truth to that—the announcements do somewhat reflect Microsoft’s reinvigorated culture and Google’s bureaucratic failings—but the real story isn’t so much that one company is winning or losing, but that both made different bets on wearable tech for different reasons. While it was immediately compared to Google Glass, Microsoft HoloLens is significantly different. As Mashable notes, the product (which is still just a prototype) isn’t designed to be a “smart companion” that you wear constantly. Rather, it’s intended to be worn only at certain times, when tackling certain tasks. As that video puts it, HoloLens is like “the next PC” and “a see-through display that you wear.” In other words, just as you look at your computer monitor at certain times for certain things, you would put on HoloLens in particular situations. There are many other differences between Glass and HoloLens, including look (eyeglasses vs. larger face-covering display) and interactions (eye movement/speech vs. hand gestures). However, the key divergence is philosophical. The reasons for the split are numerous. In part it’s based on business model (Microsoft needs to extend the PC, Google needs to extend the Internet), and roots (software for sale vs. data/advertising). The biggest influencer, though, is simply the different stages the companies are at right now. Microsoft is still a powerful revenue-generating machine, but it has missed out on a number of key technology changes (search, mobile, etc.) and needs a medium-sized win soon—one big enough to have an impact, but also with a decent chance of success. Google is right in the center of what’s happening right now—it has the top search engine, top mobile operating system, and many other highly successful products. It’s in a position to invest in big, highly ambitious projects with a high chance of failure. In many ways, the broad vision of Glass is a reflection of Google’s current commitment to taking risks. What’s also important to note is that Glass isn’t even an “embarrassing failure” yet. The company has promised to develop a second iteration of the product, which should be very different but still highly ambitious. Ultimately, both companies may succeed by taking separate approaches. 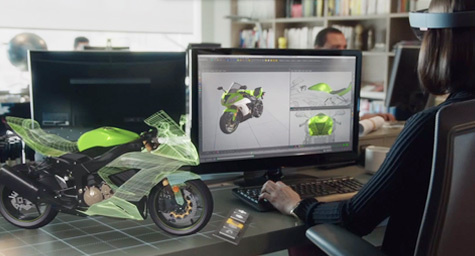 Microsoft could find success with HoloLens and extend the product’s vision to become more and more Glass-like. Google could have a few more big misses with Glass but finally release a version that connects with consumers. In other words, these two seemingly different corporate paths may lead to the same place in the end. Keep up with the latest trends in the tech sector. Contact MDG Advertising today at 561-338-7797 or visit mdgadvertising.com.